There are many times when you will have an outside organization that you wish to share free busy information with. Starting with Exchange 2010, Microsoft introduced the ability to utilize their Microsoft Federation Gateway to facilitate the sharing of free/busy information across multiple organizations. While that solution works really well, there are times when that might not be the best solution. For instance, you may have a customer in the middle of a large scale migration, or a partner company that you have connectivity to. In these situations, you can utilize the direct method of establishing and configuring sharing free busy information. This method, does require the two exchange organizations to have some level of connectivity to each other. There are two direct methods that you can use. You can leverage the forest trust model, which indicates that you have a forest between between the two Exchange Organizations. This would mean that you have a high level of network connectivity and integration between the two organizations. The benefit to this method is that you can assign per user based permissions. Meaning Paul from Forest A can have expanded rights to Jon from Forest B’s mailbox for free and busy. The second option is to use the non trusted forest based model. This means that there is no forest trust between the networks. Instead a general service account is leveraged to secure the permissions. This means that the free and busy info is assigned organization wide, meaning you lack the granularity to assign different permissions per user. I’ll walk through and explain both methods. For our lab, we have the E15.corp forest, running Exchange 2013, and SOA.corp running Exchange 2013. So the first thing we need to do is assign the mailbox servers in each forest to have the ms-exch-epi-token-serialization right on the remote forest’s mailbox servers. If this is an Exchange 2010 or Exchange 2007 environment, change out mailbox servers for cas servers. So now, the Mailbox Servers from each forest, have the permission’s necessary. For the ForestName parameter, mine is E15.corp because it’s a test lab, but this should be the SMTP namespace of the far side domain. So if the far side is contoso.com, replace my E15.corp with contoso.com. Next, we need to tell the soa.corp domain how to retrieve free and busy information from the e15.corp domain. By default, it will use DNS and attempt autodiscover.e15.corp. So ensure your source forests can resolve that address, and that they trust the certificates of the far side domain. You can also export the Service Connection Point from one side and import it into the other. If you don’t have a forest trust between the two forests, you can still do free busy, but you can only share it on an organization wide basis. In the E15.corp forest, create a user named FreeBusyE15@e15.corp. This can be a regular user account with no mailbox. In the SOA.corp forest, create a user named FreeBusySOA@soa.corp. This can be a regular user account with no mailbox. So, you need to sync the GAL to make contact objects available across both domains. Meaning, the Mailboxes of E15.corp get created as mail contacts in SOA.corp and vice versa. This allows your users to select them from the GAL and perform free/busy lookups. For the sake of our article, I’ll manually create a mailbox called pponzeka@e15.corp in E15.corp and then manually create a mail contact called pponzeka@e15.corp in SOA.corp. Then I’ll test with an SOA mailbox to see if I can perform cross forest free busy. But are these really the only steps to take to enable free/busy between two Exchange 2010 organizations with a forest trust? With a forest trust, I suppose you don’t need federation services? Isn’t? It’s not clear for me, but with a forest trust in place, do you need a GAL sync to get free/busy to work cross-organization? Hi, great post! Can you confirm whether the sync of Contacts are required using full federation? I see there is a Quest tool to auto sync users to contact records in the other domain, but if federation does not require this I would go that way. Hi, there are caveats with this approach… but it does work. With this approach you have to create contact records either side in exchange for it to work. It wont work if you just type in an email address. And there is no free tool to create contacts automatically, but it is fairly simple to export mail enabled users and create contact records on the other side. But then you have to deal with people joining / leaving the orgs. 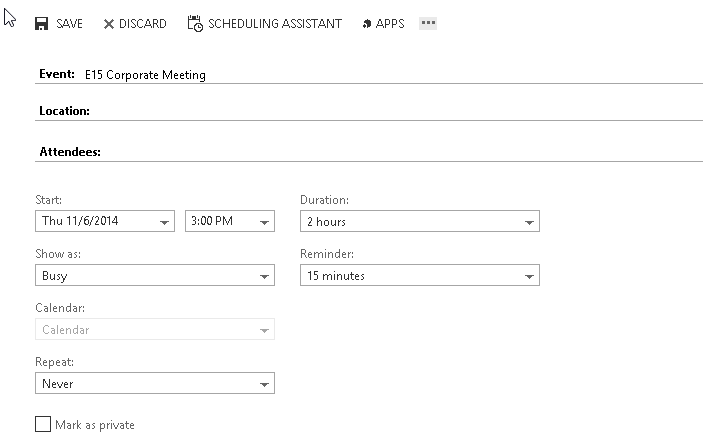 With org sharing or federation you use MS gateway to connect, but the same caveat applies with the contacts. With 2013 it does work just typing the email address.